(CNN) -- Manchester United midfielder Darren Fletcher's worst fears were realised on Monday when UEFA refused to back down over his ban from the Champions League final against Barcelona. 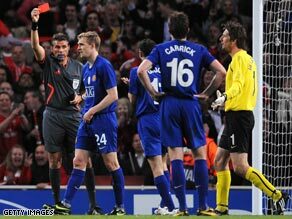 Fletcher is shown the red card that has ruled him out of the Champions League final against Barcelona. Likewise, European football's governing body told Spanish Primera Liga leaders Barca that that will be no appeal for Eric Abidal and defender Daniel Alves who will also miss the clash in Rome at the end of the month. "All three players are therefore suspended for one UEFA club competition match and will serve their suspensions when Barcelona FC meet Manchester United FC in the UEFA Champions League final in Rome on 27 May," UEFA said in a statement. "In reaching its decision, the Control and Disciplinary Body concluded (i) that the protests had not been submitted within the required 24-hour deadline of a match for filing protests -- as specified in the disciplinary regulations -- and (ii) that even if they had been admitted they would have been rejected as unfounded as there were no grounds for contesting the referees' original decisions." Fletcher's ban follows United's semifinal victory at Arsenal last week when Italian referee Roberto Rosetti sent him off for a foul on Cesc Fabregas. Television replays showed the Scotland international played the ball before sending the Arsenal skipper flying inside the penalty area, but UEFA will only consider appeals in the case of mistaken identity. A United spokesman said: "Darren is an honest player and we felt we should do what we could to try and help him become eligible for the Champions League final by initially protesting his dismissal. "However, we respect the referee's decision and we will therefore not be appealing against today's ruling." United made a request on compassionate grounds aparently supported by their Spanish rivals who in turn expected Old Trafford's backing over their own appeal. Abidal received a red card during the last-gasp semifinal victory against Chelsea while Alves collected a second yellow card.